Visual Camp, an eye-tracking tech integrator, revealed the Exynos VR III standalone headset prototype without Samsung's consent. Samsung is among the few companies that offer VR headsets, but the South Korean company requires potential VR fans to buy a high-end proprietary smartphone in order to power their Gear VR headsets. This solution is not too efficient compared to what Oculus and HTC are offering now, so it is only logical to think that Samsung is working on a standalone headset of their own. There have been rumors regarding this standalone version in the past few months, and now, we get an inadvertent confirmation from a company called Visual Camp that is responsible for the VR eye-tracking technology integration. 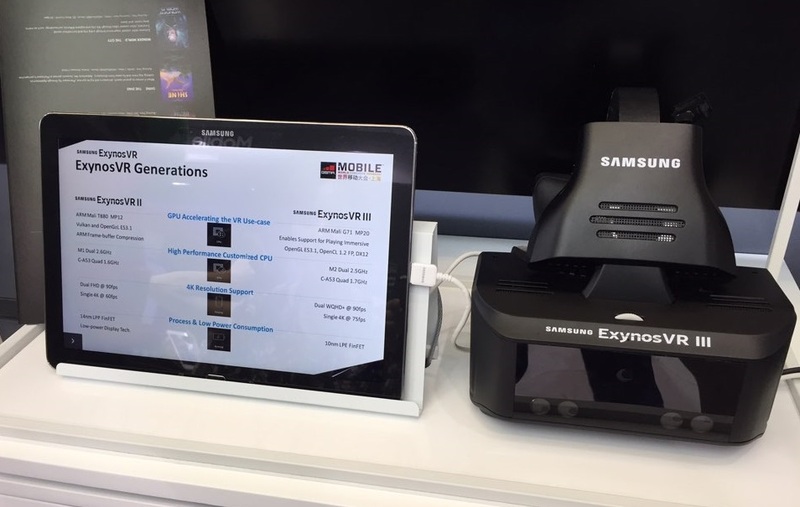 Visual Camp revealed the standalone Exynos VR III from Samsung at the Mobile World Congress in Shanghai last week, apparently without Samsung’s consent. This Monday, Visual Camp issued a press release where they also mention some specifications for the Exynos VR III headset prototype they had on stand last week. Powering the device is an ARM Mali G71 GPU connected with two M2 CPU cores clocked at 2.5 GHz and a four-core Cortex-A53 clocked at 1.7 GHz. This setup is powerful enough to support dual WQHD+ displays at 90 fps, or a single 4K display at 75 fps. Apart from the eye-tracking tech, the prototype also supports hand-tracking, voice recognition and facial expression recognition. Since Samsung has not made an official announcement themselves, there is no information on pricing and availability. Also, keep in mind that the device presented by Visual Camp is a prototype, so specifications could change for the final product.